Let's work together to make Seaport Village even better! This site is dedicated to preserving and revitalizing one of our city's treasures. Should Seaport Village be torn down, should it be integrated into a new Seaport Village or should it be left as it is? San Diegans and visitors need to express how they feel and what they want for the area before it's too late. The purpose of this website is not to stop growth, but to preserve the character, charm, success and small business community of Seaport Village. Our hope is that the Port of San Diego will select a plan and developer that shares our love for Seaport Village. Saving Seaport Village doesn't necessarily mean leaving it as it stands today. 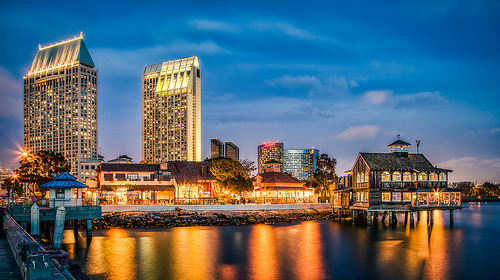 It means improving on an already amazing place and building upon what makes Seaport Village a one of a kind destination. It will take a "village" to save our Seaport Village! This will be the first and possibly the only opportunity for the public to view the plans before the Port Commissioners vote on a proposal to move forward with. All San Diegans that care about the area should come see the future of our bay and let the Commissioners know what you like and don't before it's too late. Find out what the Port of SD has in mind for Seaport Village. Tell the Port of San Diego how you feel, before it's too late..